Tick off three of Peru’s alternative ancient wonders on a full-day tour of Tipon, Pikillacta, and Andahuaylillas from Cusco. 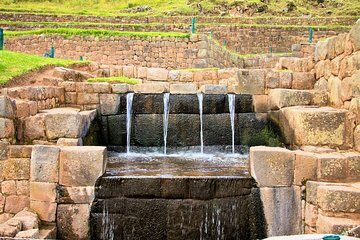 Designed for history buffs, this tour covers the elaborate agricultural terraces at the Inca ruins of Tipon; the pre-Inca site of Pikillacta, which dates back to AD 900; and San Pedro de Andahuaylillas (Sistine Chapel of the Americas), set in the central square of a tiny Andean village. Hotel pickup and drop-off are included. Jonathan, our tour guide is a professor of history. He was terrific. Our's was a tour group of 2, so basically, a private tour. I wasn't sure what the weather would be like, so I waited until the last minute to book this. We were picked up on time from our hotel. Jonathan shared with us his deep understanding of each site with wonderful personal stories of his own experiences. Tipon was the highlight. We set the pace of the tour through each stop and were free to linger and take pictures. We ended with a stop for some yummy, local bread on the way back to Cuszo. I recommend this tour. You can visit really nice places in this tour, however, the price is a litte bit higher for what you get, as the three places can be seen/walked in about 3-4 hours. Our tour guide was great. Full of knowledge and made sure he checked in with us after ever hike up the stairs. There is lots of walking, followed by a nice 45 minute drive back. Views are great. Worth the trip!